Call us for vegan gourmet catering. Our cuisine includes Greek, Italian, West Indian, Chinese and many more. Call us to cater your special occasion @ 731-926-1669. We now manufacture gourmet vegan cheeses. No dairy ingredients, no MSG, no animal ingredients. We use the finest non GMO, organic ingredients. Our cheeses can be sliced and grated. You can use them on Pizzas, sandwiches, baked potatoes, salads, steamed vegetables etc. Our cheeses are available for local pick up at our location in Clifton, TN or they can be shipped in our vacuum bottled form. Check our products page. Our new, all Gourmet Raw recipes cookbook, has now being released. Mouthwatering, guilty free, gourmet recipes. Our Ministry is a non profit education ministry. For tax deductible donations please visit our store. Beyond the Harvest...There is a Better Land. Beyond the Harvest assists individuals to understand that the right balance of the moral powers depends in a great degree on the right condition of the physical system. Our bodies are Christ's purchased possession, and we are not at liberty to do with them as we please. "Know ye not that ye are the temple of God, and that the spirit of God dwelleth in you? If a man defile the temple of God, him shall God destroy; for the temple of God is holy, which temple ye are". I Corinthians 3:16,17. Our bodies are literally God's dwelling place. So in order for us to have God dwell in us, so he can give us the spiritual discernment to make the right decisions, we must present to Him a clean physical body. A flood of sickness and disease is gradually overwhelming the lives of the people of the world. Too little attention is generally given to the preservation of health. It is far better to prevent disease than to know how to treat it when contracted. It is the duty of every person, for his own sake, and for the sake of humanity, to inform himself in regard to the laws of life and conscientiously to obey them. All need to become acquainted with that most wonderful of all organisms, the human body. With this in mind our ministry, Beyond the Harvest Health Ministries, began in January of 2001 and its purpose is to assist individuals in improving both the physical as well as spiritual health. That we achieve by conducting health seminars on nutrition, the 8-laws of health, dangerous food additives etc. in various churches, community centers and localities, and also by holding vegan cooking classes and by training individuals in Medical Missionary lines. In addition, we manufacture wild crafted organic herbal formulas to combat many different diseases as well as vegetarian meals that are palatable and tasty without hidden ingredients of MSG, dairy or animal products. The Bible in its pages describes a health message for the human being. For the past 160 years that message has been preached from the pulpits of Seventh-day Adventist churches. Still many do not take heed to that health message. Maybe the following 2 videos and information will wake people up to the biblical health message. Average Fat consumption 135 lbs/year/person which translates to 1 ton every 15 years or 4 tons in 60 years. Cancer, diabetes, heart disease, and stroke kills 70% of the world’s population. 560,000 cancer deaths are due to diet and lifestyle. With the amount of the animal contamination, eating meat or dairy products can actually be fatal to your health. A book we recommend for a complete research on meat contamination is "International Meat Crisis" by Harvestime Books. Visit our products page to purchase it. G-Godly Trust-All who are under the training of God need the quiet hour for communion with God. In them is to be revealed a life that is not in harmony with the world, its customs, or its practices. They need to have a personal experience in obtaining a knowledge of the will of God. Fix the eye upon God, and the glory of His unchanging power will do for you that which you could never do for yourself. A Christian should never be under stress. After all S.T.R.E.S.S. is spelled: Self Trust Restricts Every Spiritual Success. When you trust in your ability to accomplish different tasks you will fail. When you trust in God to give you the ability to accomplish the different tasks you will always succeed. O-Open Air-Without air man dies. In order to have good blood, we must breathe well. Full, deep inspirations of pure air, which fill the lungs with oxygen, purify the blood. They impart to it a bright color and send it-a life giving current- to every part of the body. D-Daily Exercise-God's plan for your life includes active exercise. Exercise is the fountain of youth. Exercise strengthens the intestinal muscles, improves the development of bones and muscles, improves the nervous system, increases the amount of oxygen in the body, improves the function of the heart, lowers blood pressure, and aging gets delayed. S-Sunshine-A miracle factory is at work just beneath your skin. And when the ultraviolet rays of the sun touch the skin, the factory sets to work. It is a most marvelous system; and, without it, you could not remain alive an hour. Sunlight in helps healing wounds, aids in the treatment of sores and surface ulcers, increases blood circulation, destroys many poisonous chemicals. P-Proper Rest-All who are under the training of God need the quiet hour for communion with their own hearts, with nature and with God. When every other voice is hushed, and in quietness we wait before Him, the silence of the soul makes more distinct the voice of God. He bid us, "be still and know that I am God..."
P-Proper Rest-God has design two types of rests, the nightly rest to rejuvenate our physical body and the weekly rest of the seventh-day Sabbath to rejuvenate the physical as well as the spiritual body. The Seventh-Day Sabbath was instituted right after creation in the garden of Eden. Genesis 2:1-3 So the Sabbath was made for all human creation and not only for the Jewish nation as many want to believe. L-Lots of Water-In health and in sickness, pure water is one of heaven's choicest blessings. Its proper use promotes health. It is the beverage which God provided to quench the thirst of animals and man. Drunk freely, it helps to supply the necessities of the system, and assists nature to resist disease. The external application of water is one of the easiest and most satisfactory ways of regulating the circulation of the blood. A cold bath is an excellent tonic. Warm baths open the pores, and thus aid in the elimination of impurities. Both warm and neutral baths soothe the nerves and equalize the circulation. A-Always Temperate-To be temperate means to be moderate or sparing on good things and to totally avoid harmful things and habits. Anything that can destroy or disease the human body should be avoided. Live carefully, and if you are not doing so, then immediately turn about and determine that, by the help of God, you will live a better life. Fortunately, whenever we begin living more healthfully, our future happiness immediately begins improving. Eating the right amount of the right food, and only at regular hours, is what is needed. The food should be of a simple, healthful quality, and eaten slowly in an atmosphere of cheerful thankfulness to God for His many blessings. We dare not let the fads and fashions of the world become our criteria in choosing proper nutrition.We can live as did Daniel, in full obedience to all God's laws including His health laws. Disease in animals is so rapidly increasing. People are continually eating flesh and dairy products that is filled with hormones, antibiotics, cancer, mad-cow disease, tuberculous germs and many other fatal diseases; and by consuming these flesh foods these diseases are communicated to the human body. In many places fish becomes so contaminated by the filth that is dumped into the sea waters that besides carrying mercury, a poisonous metal to the human system, they also develop exceptionally large cancerous tumors which lodge under the skin in the fat areas together with a lot of other toxins. Flesh food and dairy products are injurious to health, and whatever affects the body has a corresponding effect on the mind and the soul. The time has come that flesh food and dairy products must be discarded, its place supplied with a variety of grains, beans, nuts, seeds, vegetables, and fruits that will be both nourishing and appetizing. 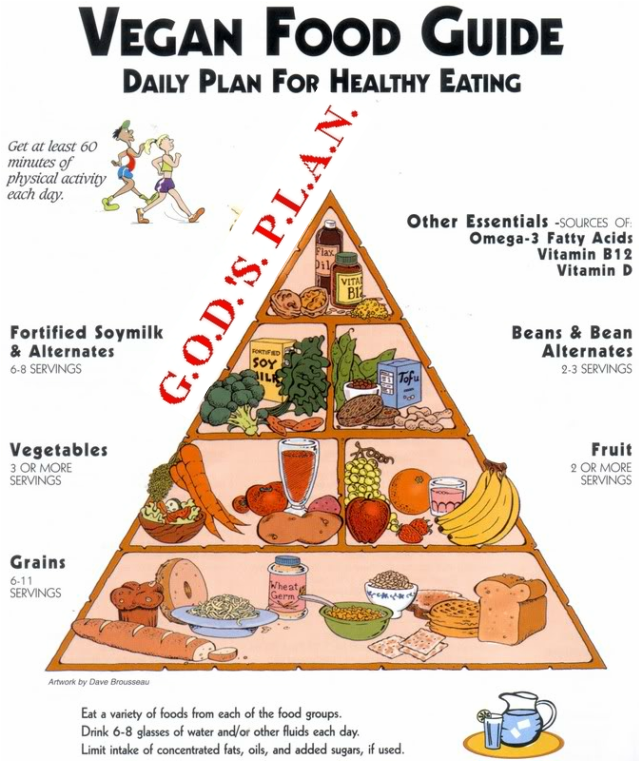 Following please review a vegetarian food pyramid as a guide to proper daily nutrition.